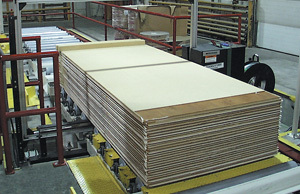 Automated Banding and Strapping Machinery is Custom-Built for any Application in the Wood and Related Industries – Creative Automation, Inc.
At Creative Automation, we integrate the banding/strapping machines of the customer's choice into automated lines to deliver production efficiencies and labor savings. Bottom spacer and corner protection insertion is available. In this system, bottom spacers are inserted automatically. The number of spacers is selectable. Closeup of the above system. 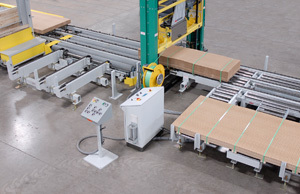 Integrated automatic bander for finished loads of laminated panels. 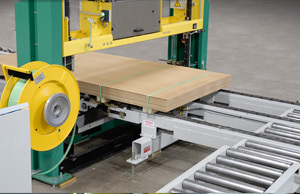 Number of bands per load varies automatically based on load length.